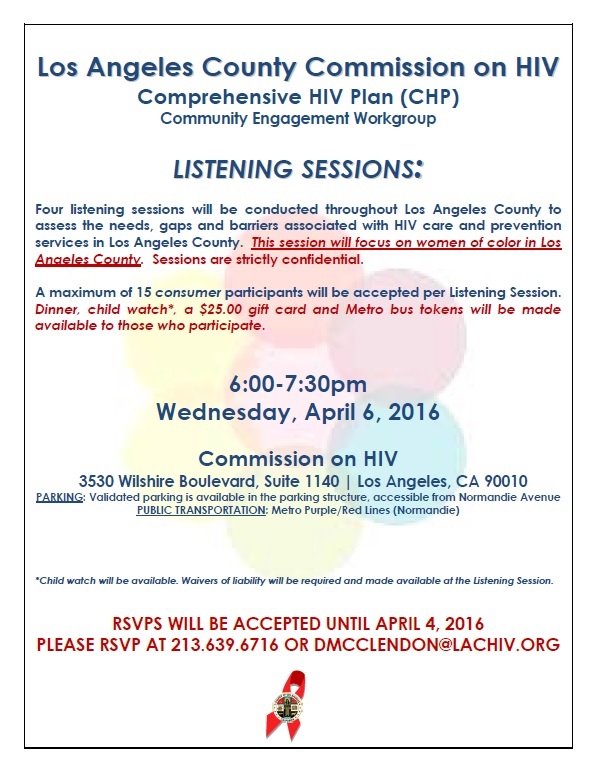 The Commission on HIV has planned four listening sessions throughout Los Angeles County to target specific communities to assess the needs, gaps and barriers associated with HIV care and prevention services in Los Angeles County. This information will serve to assist in the development of our federally-mandated Comprehensive HIV Plan (CHP)*. We have now confirmed logistics for the second session which will focus on: Women of Color. We are inviting consumer (HIV+ and high risk HIV-) women of color to participate. As reflected in the attached event flyer, the session is scheduled for Wednesday, April 6, 2016 at 6-7:30pm. The session will be held at the Commission’s office. Bus tokens, a $25 gift card, dinner and child watch** will be available to those who participate. The session is strictly confidential.